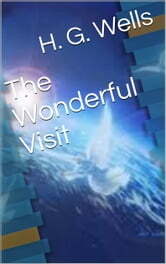 The Wonderful Visit tells how an angel spends a little more than a week in southern England. He is at first mistaken for a bird because of his dazzling polychromatic plumage, for he is "neither the Angel of religious feeling nor the Angel of popular belief," but rather "the Angel of Italian art." As a result, he is hunted and shot in the wing by an amateur ornithologist, the Rev. K. Hilyer, the vicar of Siddermoton, and then taken in and cared for at the vicarage. The creature comes from "the Land of Dreams" (also the angel's term for our world), and while "charmingly affable," is "quite ignorant of the most elementary facts of civilisation." During his brief visit he grows increasingly dismayed by what he learns about the world in general and about life in Victorian England in particular. As he grows increasingly critical of local mores, he is eventually denounced as "a Socialist."